There are things that we know. And there are things that we know that we don’t know. And there are things that we don’t know that we don’t know. These last are the “unknown unknowns” made famous in a comment by former US Secretary of Defense Donald Rumsfeld. Those things that we don’t even know enough to know that we don’t know lay so far outside of our existing frame of reference that we can’t even imagine them. They are too far out of our box to hold in mind. What endears me to Pragmatism more than anything else is the respect given to the existence of truth beyond our current ability to imagine. James and Peirce both assumed that what we knew about reality (and even what we can imagine to be true about reality) is only a tiny part of the totality of reality. And they envisioned a way of going about philosophy in light of this. They created a form of inquiry and a philosophical attitude that was militantly open ended. “Never block the road to inquiry” was Peirce’s motto. And William James railed against what he called vicious intellectualism. Vicious intellectualism as James described it was the conscious or unconscious assumption that the affirmation of any truth implied the negation of all other possibilities. As long as we are working within a limited frame of reference this assumption works well enough. So if I look at an object and assert the truth that this object is blue, then it is safe to assume that I am simultaneously asserting that it is not red, yellow, green, or any other color. The reason James was so bothered by vicious intellectualism was that it tended toward a method of inquiry that resisted stepping outside of its own frame of reference. If we are consciously or unconsciously assuming that what we think is true actually is true and negates all other possibilities, our inquiry proceeds by expanding on what we already know. We focus on what we know and push at the borders creeping slowly out into the vast oceans of unknown that surrounds our small island of known. James and Peirce wanted our thinking to be free. They wanted to hold on loosely to what we think is true by assuming that whatever we think is true now will yield tomorrow to a much bigger and more encompassing truth. Rather than defend what we know and expand on it slowly they wanted to inquire directly into what we don’t already know by focusing on the anomalies and oddities that don’t fit into our current understanding. James felt that our attention should be on the outer fringes of what we know. The next big idea doesn’t come from the center. It comes from the dim outer edge where the light of what we currently know fades into the blackness of the unknown beyond. James risked his career and his reputation as a scientist to study things that others thought were absurdities. As the president of the American Psychical Society he studied spirits, mediums, and life after death. Most scientists felt this was worthless, but James felt that it was out there on the fringes that we would find passage ways to new and unexpected vistas of truth. James and Pierce talked about a new way of seeing life. It requires humility, boldness, rationality to discover a more integral truth. This sounds a little like the “Grue Paradox” I studied in college. It is so interesting how more and more and more unfolds and reveals itself when we are interested in that which we do not already know! Nice post — I enjoy how you draw a through-line from James to Rumsfeld in terms of the value of exploring unknown unknowns, and the humility called for to do so. Rumsfeld brought out three categories: known knowns, known unknowns, and unknown unknowns — and most commentators focus on this last one. But there is a fourth category, and I believe it is the most important — unknown knowns. This is realm of what we know, but don’t acknowledge we know. In other words, it is the realm of our unexamined and unchallenged assumptions and assertions about the world, things we just assume to be true for no clearly good reason. In other language, it is the realm of our unconscious motives. In my own experience, my unknown knowns are the things that most often the things that impel me to act irrationally or harmfully, with only dim self-awareness at best about the real nature of why. These are the most problematic — even moreso than unknown unknowns — because I cannot act on the latter, except to realize it exists as a category to be aware of — but we all often act on ‘unknown knowns’ … It is, in my experience, a radically deeper humility to admit there are large portions of myself that I do not know well, and large portions of our social consciousness, our cultural context, that we as a society hold to be true but do not acknowledge. In fact, I think one of the best explanations of how managed to go to war with Iraq under Rumsfeld was his ignorance of this last category. Many of the traditions of examining interiority at some point raise this matter as a central challenge, of bringing into full awareness one’s yet-unexamined assumptions, unconscious motives, pre-cognitive contextualizations, or formative experiences which continue to inform our choices and actions. I believe this mode of inquiry into ‘unknown knowns’ deserves a much more central role in the broader epistemological discourse and it would have broad-based repercussions across various philosophical and theoretical disciplines if it did. Awesome Blog Jeff. Love the title and that image too. Really asks us what it means to stand alone, let all of our deeply held beliefs go, (yes, even the ones we think we can’t or shouldn’t let go of) and make room for that which we don’t even know what we don’t know and simply question, look anew at life, at ourselves, at why we are here for and what it all means. It is like the strongest iron (or tree, to keep with your imagery) is that space of inquiry it self, not the conclusions that are drawn from it. Thanks for the pointer Jeff — the Morris series is interesting! He repeatedly refers to Dunning’s book, Self-Insight: Roadblocks and Detours on the Path to Knowing Oneself seems to point to a number of interesting areas as to the mechanism of how people fail to see themselves clearly — dealing mainly with people’s tendency to overestimate their competence and character. I believe there’s a realm beyond these two that I think is even more fruitful to look at — and that is, the realm of perspective. People can be highly skilled and moral in a conventional sense, as I believe Rumsfeld is, but still lack deep insight into why they make the choices they do or advocate for the positions they hold. When such self-ignorance can play pivotal roles in the fate of nations and hundreds of thousands of human lives, which is the order of the current casualty count of Iraqi civilians, the consequences are far more serious. I hope those publicly leading the way in illuminating the value of the interiority traditions persist and widely succeed in their efforts, especially in connecting them to the view that our ignorance of ourselves is perhaps our greatest existential threat. It’s my feeling that the urgency of this work cannot be overstated. I thank you for raising a very interesting line of inquiry in this context. this was in interesting period where as a French I was on the brink to loose 1/2 f my american friends while the there half was ready starting to see “French arrogance” and “French independence” in another way. I am still proud that at the end of the day we didn’t stepped back in and put out veto in the UN despite the incredible pressure the american democracy was putting on us. The Brits have completely betrayed their soul on this occasion, because as the oldest and most successful colonial power they knew, they knew very well that Irak is not Japan or Germany and that it is almost impossible to “impose good” on them. I think Tony Blair’s reputation is still paying of this betrayal of the Truth. Anyway, at the end it was French arrogance against american arrogance and power, and americans did go and were wrong. And Berlusconi, Blair and others betrayed the European knowledge and expertise on this matter. Anyway Vikram and Jeff, I got completely carried out. I think Vikram is right, those american leaders before Obama were completely unaware that humanity already had this knowledge, and that despite the obvious French arrogance, it was some years and years of colonialism which was speaking to them not to go. Let me answer the wonderful blog ! One of the reasons I got so passionate about this blog a few years ago is that I realized that Americans generally don’t know what they don’t know about their own philosophical heritage. It can and has been argued that American philosophy pales in comparison to its European counterparts, but be that as it may American philosophy is a unique perspective on reality. It is the perspective that underlies American thought, it proved incredibly successful at navigating through the twentieth century and I believe it has become increasingly incorporated into the minds of those around the world. I also feel strongly that if American’s understood their own philosophical tradition and the wisdom that it contains we would find that it has warning aplenty about the unknown unknown. 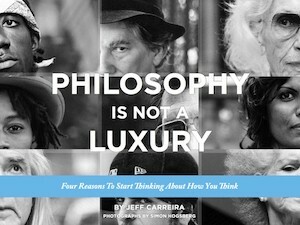 I have at times been criticized for the limited slice of philosophy that I look at – but I suppose, as an American, one of the philosophical leanings that I have inherited is a certain “democratic outlook” which means seeing philosophy as needing to be directly relevant to the common person and the kind of common person that I am – and am surrounded by – happen to be American through accident of birth. It brings me great pleasure and much food for thought to have the diverse opinions of non-American’s expressed on this forum. In the classical period of American philosophy – from Emerson to Dewey – philosophy was seen as a public enterprise and our greatest philosophers which include Emerson, Dewey and William James were extraordinarily well known figures whose wisdom was sought for to guide peoples’ thinking. I fear that today philosophy has become so isolated in the academy that most people have to look elsewhere for intellectual guidance. This I feel is a tragedy as there is enormous wisdom in our present day philosophers to be shared. Even our x-secretary of defense in his use of the term “Unknown unknowns” was tapping into the wisdom of philosophical tradition – unfortunately he and others – including I suppose me – were unable to extend the principle far enough to avoid the negative consequences of the Iraq war. I hope that we all fare better in Libya. As a matter of apology, I will say that the French are all secretly in love with the USA; for me the offering of the Statue of Liberty, one hundred years after US independence, at the time where France was in one of its most mediocre periods [ the second empire], is really the symbol of True Love. Something like “ thank you so much for having let us help you ! ” something like “ please be great when we cannot be anymore, and be free when we cannot be…” a soft sharing of ideals of freedom and drive towards greatness. A gentle passing and blessing to a younger country with so much potential ! Any way. The blog is absolutely wonderful today. The frontier of knowledge. the border, and interplay between the known and the unknown. The “known unknowns” and the “unknown unknowns”. It is a very subtle frontier and a very important one, I believe. For me it is the frontier where Science meets the Sacred, it is one of the frontiers where the New emerges in our world of Form. So it has to be examined very carefully indeed, and as matter of precaution, I would not rank sides with the Pragmatists straight away, but first listen to what the Idealists too have to say about this frontier. One of the most challenging thing I have ever heard about the frontier of the known and the unknown is the sentence by J. Krishnamurthi, which used to drive me crazy 10 years ago : “ Intelligence starts where Knowledge ends”. I must say that for our highly mental-driven western culture this a tough one to swallow. For years, this book by K. [ “ the awakening of Intelligence”] was the only spiritual book I had in my library [ it had been offered to me by a friend in Boston] and I always wanted to throw it away but couldn’t. This sentence, especially used to drive me nuts. I thought the guy [ Krishnamurthi] was absolutely arrogant, that he himself “knew nothing at all” and that it is easy “when one knows nothing” to say that Intelligence starts where Knowledge ends. I can still relate to the anger that sometimes arise in my physicists friends when I talk about spirituality, when I think of me at that time. What is the nature of this mysterious frontier, the frontier where “knowledge ends ” ? is it, as the great Krishnamurti tells us, the frontiers where Intelligence awakens ? is it the frontier where many awakenings do happen ? is this frontier known, is the frontier itself unknown ? can we be casual about it ? can we say Absolute Truths about it ? can we relate to it intellectually ? can we relate to it emotionally ? Shall we relate to it with our beliefs ? do we have to related to it at all, or shall we better not ? What’s good with this fantastic subject is that all the questions about it are valid, all of them ! it is as if ANY question honestly asked about it, any “death or life” question, will have the potential to change the course of a life. Just try it. It is what happened to me. The way I personally deal with this frontier is to address it in as many possible ways as I can. Intellectually a surprise is awaiting for us when carefully looking at it. A big surprise. Science tells us that this frontier is known, not blurred, not unknown, but KNOWN. Just simply known. This is a back and white answer and I would state that anyone who doesn’t admit this fact doesn’t respect the full potential of human intelligence. It is a very simple fact : Science knows with Absolute Precision where and when its own knowledge ends. That’s why the true greatness of any scientist is to never, on no occasion pass this threshold. To always respect this frontier where knowledge ends. A scientist who by passes it, who for example make science tell us conclusions that are beyond its reach, or who mis-represent theories of the past to suit their own ideas of the moment, have already betrayed one of the very few sharp points where the Asolute is reachable to the mind. It is something quite great actually, that what Science knows the best is where its own knowledge ends. It is something quite humble. and truly great. A true scientist always knows where the frontier is, and sometimes just staying at this frontier and not moving anymore, God can start to speak to us, and a higher Intelligence awakens, indeed like Krishnamurti was saying. Now Jeff is taking the pragmatic side and he addresses the frontier of knowledge in a different way. The key issue as he puts it, is not to get stuck in the known, but always leave some open space for the unknown, for the potential of New that the unknown can bring. He raises a very deep and important question indeed; it is the question of being REALLY opened to what is New. What is the best way to be really open to what is New, to be really opened to the Flow of Evolution ? shall we, as Jeff confessed he did, rank with the pragmatists ? shall we rank with the Idealists ? with a combination of both ? shall we not rank at all ? If I contemplate the history of Evolution in recent years, I would say that the pragmatists win by far for all that is the political, and societal realm, while the Idealists are still un-paralleled on the level of Scientific evolution, for example. The key example for me is Germany. I feel no other country has ever reached the cultural level of Germany before the second World War. In Phsyics, Philosphy, in arts and musics they have reached a level which has not been repeated afterwards. They were pure Idealists. And yet the same culture is responsible for one of the worst abomination ever. A bit of pragmatic “not knowing” would probably have been enough to prevent it to happen. Where I still differ from Jeff, due to my cultural belief system, is that my heart is still with the idealists. I still believe the best way to be open to the unknown is to the absolutely sure of what we know, and to, under no circumstances, betray what we know unless some higher truth is making its way to us. This is my way to be open. It is this faith which has had the power to bring me from the materialistic Scientific state to Mind to the sense of the Sacred that Krishnamurti was inviting me too. Without a very strong desire to Know, to Absolutely Know, I would probably not have reached the frontier of knowledge itself. Would the pragmatic attitude been a strong enough incentive to bring me there, to the Sacred ? I doubt it. With the pragmatism I would have probably stayed very well cocooning in the scientific materialistic background, which is itself so pragmatic. Pragmatism is not strong enough in the present state of our culture, to bring a modern scientist, for exmaple, back to the Sacred, back [ or forward] to God. Only Idealism can, at the moment, I believe. The world has sank too much into very petty considerations and pragmatism is one of the most responsible for this state of affairs. I feel the humanity with Big Ideas will have to come back; hopefully we will handle them better than than in the past ! Thanks to Catherine some time ago I bought a book about Fichte’s transcendental philosophy and, very soon after reading I could connect it to this blog…Reading later Catherine’s post it is clear that this is about the Idealists, but what I think is interesting in connection with the blog is the importance he gives to practice, to practical intelligence, to theory and practice; to knowing and doing; to intelligence and will. These are basic to human existence. Fichte is concerned with the acts and objects of that intelligence. He addresses that which is fixed or given in human existence (determination) and that what is ‘open and yet to be realize’ (freedom from all determination except that which human being gives to itself freely). Determination is to become self-determination. His idea of freedom forms the basis of his moral theory of radical autonomy, its object is spontaneity. He says willing involves thinking and thinking involves willing. This is mirrored in the double role of ‘ideal’ and ‘real’ . I think the ‘unknown unknowns’ connects with Fichte’s ‘unthinkable ground of all thinking and willing’ or ‘infinite will’ or ‘the absolute’. It will take quite some time to understand what this is all about, but as so often through this blog, it challenges to really understand what this guy was talking about.. I would like to come back a bit deeper to the contemplation raised by the blog and also by Vikram and Liesbeth, about “what makes vicious intellectualism so vicious”. When Vikram has put the category of unknown knowns as one of the most important, I felt I side back completely with him. Maybe it is an issue for our post modern culture and its New Age under currents, but on this special topic I feel we are on the brink to loose the sharpness of what modern scientific mind -set has brought to us. I want to illustrate this with an anecdote. A few years ago I was at conference with a good american colleague and friend called Mike. We were listening to a talk , and the guy talking didn’t seem very convinced about what he was talking about. he was kind of never sure, about what his theory was predicting, about what the experiments were excluding. It looks bad, but believe me, this dispassionate attitude is more and more common even in sciences. At some point Mike started to address him in a very animated way, in a very “ good pragmatic american way” he told the guy : “Don’t you want to know… don’t you want to know the truth ? don’t you want to know the scientific truth about this experiment ?” This came out very strongly and I will never forget this moment. It was so american, like Mike was almost hurting the table with his fist while asking this question. It was down to earth and very elevated, very idealistic at the same time. Blunt honesty, even bluntly painful honesty armed with desire to know is probably the best asset of science. If we loose, as scientists, the knowledge of he frontier of knowledge, if we deny that we known when we stop to know, then we loose something infinitely precious. That’s why it breaks my heart when scientists and then our culture talk for example about the Big Bang as the origin of Time. We simply don’t know this. Before reaching the origin of Time, there is a big problem on the way called “ Planck’s wall” the energy scale at which Quantum Mechanics meets General Relativity. Beyond this scale not theory is working and we have tried tried tried for now years now, with some of the best brains on the planet without succeeding in any convincing way. So for science, Planck’s wall is precisely where the frontier of knowledge stops. It is a sacred place to be and no scientist [ and no one aware of this fact] shall speak about the Big Bang as the origin of Time, because we have no clue whether this is true. I know it is a critique for my beloved Teacher Andrew, but I have no choice but to maintain it. Jeff if you can transmit to him, that it breaks my heart every time I hear him speak about the Big Bang as the origin of Time, I would be grateful. This concept is inferred from the theory of general relativity and extrapolate to the would be singularity of Time. The point is that on the way there is Planck’s Wall and beyond this our theories stop working. I feel Andrew doesn’t need this, he doesn’t need to use a scientific analogy which lies beyond the frontier of knowledge. It breaks my heart because this frontier is Sacred at least for me, and I am always thousand times more excited to contemplate it rather than to by pass it. The Planck’s Wall, isn’t it mysterious ? isn’t it an absolutely beautiful and thrilling frontier for modern science ? we shall address it with respect and humility and simply bend our knees in front of this Planck’s wall. thanks for making me think so much over this blog. Cosmologists cannot explain the cosmic condition at the very beginning (time = zero), since the Big Bang Model starts at the “Planck Wall,” named for Max Planck (1858-1947), the founder of Quantum Theory: physics on the smallest space-time scales. unequal to the task of contemplating the very beginning. Even many cosmologists acknowledge a sense of cosmic agnosticism in reference to this issue. They believe the Big Bang happened, but cannot explain its operating principles at zero time. Whether or not the human mind will ever be able to surmount this barrier remains to be seen. We do know that a lot remains unknown and might stay that way for quite a long time. Catherine, this is exactly what I liked so much about reading Green’s book about the cosmos. It showed all these sharp lines very explicit. I was surprised to read so often that things were not known yet and some things we might never know and with that the great excitement about what IS known and especially the great findings become clear in their magnitude –like Einstein’s. But I think there is a difference between the sloppiness of post-modern culture and non-professional physicists. I think it is good that you mention the scientific edge, but this is about two different professions. A scientist vs. a guru. If you listen and/or talk as a scientist, you will never be able to ‘go beyond your mind’…and that is (among other things) the task of a guru. The thing that turned me to Andrew long time ago was that I asked about ‘God’ and he said ‘that cannot be know with the mind’, that is what a spiritual teacher talks about. I think his attraction to scientists is because for so much of what Andrew is saying (from his own experience as a spiritual teacher) theoretical evidence (in great lines) is found, but he does not call himself a scientist, he calls himself a spiritual teacher. And ‘spirit’ is not mind. The magic of Andrew’s teachings lies beyond the mind. When a spiritual teacher says there is no time (‘occurrence’) during meditation, it has a different meaning than a physicist saying that there is no time. I would say that when Andrew talks about the beginning of time, he is talking about the evolutionary impulse, the origin of creation that comes into being, and he always did say ‘whatever that may be’. When you are on a meditation retreat, are you constantly checking if everything he says as ‘there is no time’ is scientifically right? Time only begins when meditation ends, is that theoretically true? I remember Deepak Chopra did a scientific investigation about prayer. If I remember it well, he found a correlation, that people who where prayed for where slightly doing better, but he could not exactly say what caused it…was it the attention, was it the prayer itself, was it God’s influence. But Chopra is a scientist. Take Krishnamurti who says that ‘thinking is the one thing that connects us all’. He says ‘change starts in our consciousness, we have to watch our consciousness itself, he says ‘your consciousness is the consciousness of humanity’ what is that for science? It is not proved, and yet, science is pointing that way and when we believe we can change consciousness –and with that the world, much more will happen than when we say ‘it is not scientifically proved’. But the more scientific basis is found, the stronger the message gets, even though it is not essential. I definitely would criticize a scientist when he/she was talking unfounded, but I would also definitely criticize a spiritual teaching if I wasn’t able to go beyond my mind! I know Andrew doesn’t talk about the same thing, in the same language as Science does. Look he has convinced me , I am completely sure he speaks a deep Truth when he talks about the Origin of Time and the Evolutionary Impulse, and still, I cannot help that he breaks my heart when he equates this Origin of Time with the Big Bang, because for a Scientist, it is just something we don’t know yet. Maybe yes, maybe no, but at the moment the frontier is at the feet of the Planck’s Wall for us. Not at the Big Bang. Andrew’s teachings are extremely rational, and they are scientific in many ways, and especially in this way, that Andrew is incredibly good with the frontier of knowledge, in general. So it is just that the Scientific frontier of Knowledge is also Sacred and is being massacred by our culture, our post modern culture. it is indeed unfair to put any critique on him. But even in this case, the scientists he interacts with shall receive some of my critique for not having told him that there is a sacred threshold of Knowledge not to be by passed here. If I don’t tell him this, I will also fail him in some way, like those scientists he interacted with. Science is absolutely not about waving hands, being excited and making a movie which we can sell very well. Science, where it touches the Sacred human aspiration, is about the desire to know and the knowing of the frontier of its own Knowledge. For me it is frightening that scientists themselves start to tell science fiction stories far beyond the frontier of Knowledge [ nothing against science fiction though]. As if scientists themselves don’t hold anymore the keys to their own Temple of Truth. when you talk about going beyond the mind then you are right. Andrew was so far the only one who has been able to take me a little step in this direction. But I would lovingly criticize scientists [ myself included] for not always embracing wholeheartedly this aspiration to go beyond the mind, and I also would lovingly criticize a spiritual Teacher for sometimes trespassing the Sacred frontier of scientific knowledge. Humanity has everything to gain by uniting Science and Spirituality. It will not be every day easy to do it with anthenticity, but isn’t it a thrilling goal ? Of course you are right telling the truth and pointing towards the edge. Andrew is the first one interested. I have been thinking a lot about this connection. When I read about Einstein I thought he was spiritual, only someone who is able to go so much beyond the mind can do things he did. Spirituality is connected with ‘believing’ which is of course very wide. You are a person who of course is very much on the edge, connecting both and so is Chopra. My idea is that Andrew is first and foremost a spiritual teacher. He is far beyond most spiritual teachers who just do not want to let science interfere, but science does interfere. Because it is not only letting the mind go, it is also talking and thinking beyond all those boxes with scientific and cultural content. I think this is the most challenging thing on earth. That is why it is so subtle and why someone like Andrew is so precious; he can see the difference between non-sense and spiritual, between sense and no-sense. In the beginning I often thought that someone was talking non-sense, but then it seemed OK, – I just wasn’t able to really listen, because I could only listen with my rational mind (which means based what I have learned). It is talking from a different source –it is the universal mind that Krishnamurti was talking about. I always think that when they say that Jesus ‘could talk different tongues –languages’ this is what is meant, universal mind, which can be understood by all people (if not too rational). I think Fichte–from what I read until now- is talking about ‘this basis’ from where we talk from, the connection between ‘knowing and doing’, first of all it is a choice and an action to choose what kind of knowledge we absorb, what fundament we create from where to act from. I think Andrew is working with this very much. But somewhere there is also ‘a universal mind’, where we also can tap into, if we are guided. For example also in Bible studies this universal mind is mentioned by Jesuits, it is very similar. It is like great art, the message is not so much in the words or logic, but in its expression (poetry). Just like we drink wine from one bottle and water from another, we talk science from our rational –learned- mind and we can talk ‘universal language’ which constantly wants to go beyond that which is known, but in a different way than science does. Science ‘builds’, while this ‘experiences’ maybe. I do not know, who knows what it is, but it seems last retreat you where collectively acting out of it. Where does the natural care comes from, the natural intelligence, I have no clue. Thank you for this comment. And I think with the example of Mike you capture the spirit of American philosophy perfectly. It is an almost impossible combination of “nuts and bolts” practicality with extreme and sometimes even naive idealism. I am so inspired by what you wrote here that I am going to let it act as my muse for my next post. And thank you Liesbeth for that input on Plank’s wall. there are so many things I would like to answer to your last post, but I will focus just on one, the relationship with the Teacher. When I say “it breaks my heart” when Andrew equates the Big Bang with the Origin of Time, it is not a sentimental saying. IT is that this threshold of Scientific knowledge is really Sacred for me, and I wince every-time someone trespasses it. Now if I don’t tell this to Andrew, what kind of position do I take with my teacher. For me it would be something like “ as a scientist I know better but I will not tell you because you are not a professional scientist so you have the right to make the mistake”. This position is not good, it makes scientists as a special cast of people with a special knowledge which ultimately belongs to humanity and not only to us. Everyone has the right to know where the frontier of Scientific knowledge is. It is a human right to position oneself with respect to it. I feel it is so serious. Now Andrew is not a kid, he is very bright. If I tell him that this frontier of Scientific knowledge is Sacred, he will make his own mind about this statement. Many people told me I am too serious about these things. I don’t feel I am “too serious”. Maybe I don’t say things in the right way, but the frontier of Scientific knowledge is one of the most serious and humble thing I have ever met in my entire life. Can I be with all of you on this ? Jeff, Mike is indeed a great physicist. He happens to be one of my best friends as well,one of the very few who knows that I follow Andrew. For me he has been for a long time one of the best ambassadors of american culture, with a rock solid life long friendship always putting his cards on the table, always here if you need him. Incredibly reliable and good. I am not the one to say anything about it, it all evolves and I have been away. But this is definitely the place to talk about science, it is absolutely fascinating, thank you, love Liesbeth. ps. If I was able to draw a cartoon, I would make one of you during retreat: turning everything Andrew says into equations…. I wish you a great retreat! Even though I am not a scientist, I am following this with great interest. Thank-you for the great discussion! I tend to agree with Catherine, that it is her duty as a scientist and as a disciple of Andrew, to keep him informed of the threshold of scientific discovery, the Sacred Space on the edge of the unknown! Wow! Thank-you Jeff for this forum! Excellent article. William James “vicious intellectualism” has another name — “logicism”, which is “the authority of reason” become dogmatic ideology, just as “moralism” became dogmatic ideology following from “the authority of the Bible”. The “Age of Reason” and the “Age of Faith” both follow a pretty interesting, parallel trajectory of rise and fall. What I’ve been able to glean from this curious parallelism is this (some of which was argued in the works of the cultural philosopher, Jean Gebser): the mental-rational structure of consciousness preserves it’s psychic architecture or “identity” based nothing more than the rules of logic — syllogism, dialectic. Violation of those limiting conditions (say, by paradox) and you step outside the structure — meaning “mad” or “insane”. The mytho-religious consciousness structure is not concerned with syllogism or dialectic, but with the problems of hybris (sin) and Nemesis (retribution) which, in Buddhism, is represented as the karmic law of action and reaction. “Transgression” is violation of a limit, the limit which defines the psychic architecture of the mytho-religious consciousness structure (or identity) itself. In some ways, therefore, the consciousness structure of the “Age of Reason” as well as “the Age of Faith” is based upon a self-referential tautology that is just as much evident in “rationalism” as in mythology. You might recognise the issue of Goedel’s Incompleteness Theorem in this, as it is reflected, too, in Nietzsche’s objection that “the will to a system is a lack of integrity”. In other words, and ironically, rationalism becomes as much a dogmatism (we’ll call it “logicism”) as “mysticism” became in decaying into a mere moralism (fundamentalism, Inquisition). Both, it appears, are symptoms of the disintegration of a structure of consciousness in which both reason and faith, as modalities of consciousness in terms of syllogistic or dialectical consciousness, or, on the other hand, symbolic thinking and metaphorical consciousness) become deficient in expression, and become thereby reactionary.